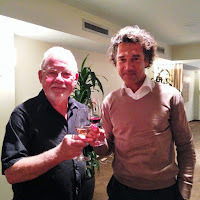 I’ve written about some of Jean-Claude Mas’ other wines before, and today I need to write about another. Really, I think it’s his fault because Mas is putting out some of the best product at value prices anywhere in the world today. His wines are quality focused, but casually enjoyable and at value prices. The Languedoc area in which Cote Mas is located is well known among those in the know for producing excellent value. The Domaine itself is centuries old and Jean-Claude is the fourth generation winemaker who took the helm of Domaine Paul Mas in 2000. 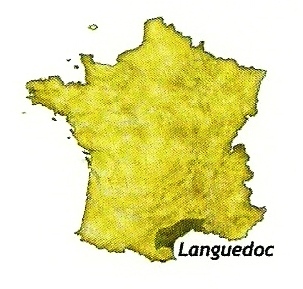 Since then, he has expanded the operation beyond the family’s original estate in Montagnac to now include nine estates across the hillsides of the Languedoc. Grapes are either estate grown or sourced from long term grower contracts. His philosophy is labeled (by himself) as Luxe Rural.” And he defines it as: “… about finding pleasure from what you see and hear around you. Things don’t have to be very expensive, (he says) In fact it can be something as simple as a perfectly ripe peach or a beautiful view.” To those who have enjoyed a ripe, farm fresh peach at its peak, or viewed a spectacular water sunset, let me say you probably understand his appreciation for natural perfection. For those whose only experience has been with peaches that are as hard as shipping cross continent necessitates … well, you’re in for a treat with this wine. but haven't gotten any taller! In 2012, Jean-Claude brought his “Luxe Rural” philosophy to life with the opening of the Cote Mas Restaurant at the original winery in Montagnac. With an original farm-to-table menu, Cote Mas wines were introduced at the restaurant and became so popular that tourists and travelers wanted to be able to enjoy them at home too. 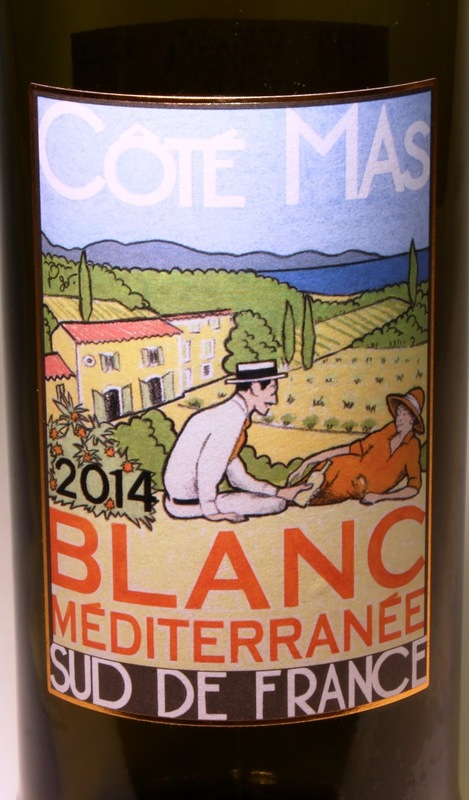 Cote Mas Blanc Mediterranee is one of those original four wines and is now available worldwide. I first tasted this wine in June and again in August last year and was struck, nay – delighted each time with its masterful balance and sophisticated nuance. 35% Grenache Blanc, 25% Vermintino, 25% Chardonnay and 15% Sauvignon Blanc, each grape is vinified separately. Each enjoys short skin contact, pneumatic pressing and stainless fermentation to preserve fruit and freshness. Free run and first press juice only are used in this wine. In the glass, it shows medium lemon and offers a wondrously lovely nose of quince, orange pith and pineapple. Flavors of orange segments emerge and a hint of lime develops and as the wine finishes lemon develops again but richly as with lemon curd. The wine finishes cleanly with tastes of citrus and in well balanced acidity. But what most impressed me about this wine was its nod to tradition despite its “new world bent.” This is a wine of finesse and, despite its citrus character, subtlety. Nothing is overpowering. Nothing clubs. It has grace notes: Balance in a classical old world style. On my own I tasted this against two popular new world whites in the same price arena. In each comparison (I won’t mention the brands) I found Blanc Mediterranee to be less sweet (read that to be not cloying) and with a cleaner finish, making it more adaptable to meal pairing. In a very well-known and popular white domestic blend of three grapes, Blanc Mediterranee also came with the advantage of costing less. As with others of Domaines Paul Mas and Cote Mas, the wines burst with personality and express their unique terroir. And, in this example, the wine does this at a suggested retail price of only $12.99 (often available at even less). Retail shelves here in the U.S. often look to foreign visitors as over supplied with choices. Indeed, competition for shelf space is intense. So, at times, I enjoy tasting wines but they’re tainted with a tinge of regret knowing the wine may be difficult to track down. In my area, several Mariano’s (retail grocery) carry this wine. If your favorite liquor store doesn’t, they may be able to order it for you. The Languedoc region continues to gain recognition as a source of wines with an outstanding quality to value ratio. And in 2015, the Drinks International sommelier poll ranked Domaines Paul Mas among the top 50 most admired wine brands. Mas wines are imported by Espirit du Vins/Palm Bay. Like Wine Mizer on FaceBook for mini reviews (almost daily) of wine, recipes and fun facts.